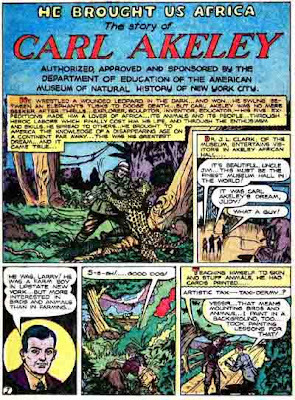 The Hall of African Mammals at the American Museum of Natural History exists thanks to the efforts of Carl Akeley (May 19, 1864 - Nov 17, 1926) who was the kind of adventurer that Indy Jones could only dream of being. He died on an African expedition in 1926, ten years before this hall was completed and was buried in a place depicted in the Hall's famous Gorilla Diorama. Of course we approach collecting and conservation differently today, but Akeley is to be commended for his love of nature and his desire to present its hidden corners to the world. 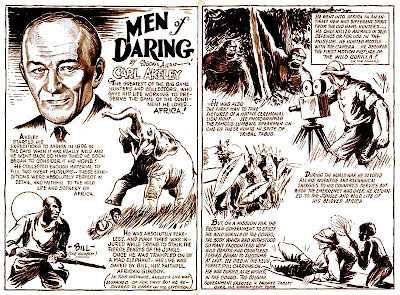 Carl Ethan Akeley was an American naturalist and explorer who developed the taxidermic method for mounting museum displays to show animals in their natural surroundings. His method of applying skin on a finely molded replica of the body of the animal gave results of unprecedented realism and elevated taxidermy from a craft to an art. He mounted the skeleton of the famous African elephant Jumbo. He invented the Akeley cement gun to use while mounting animals, and the Akeley camera which was used to capture the first movies of gorillas.